Here it is! 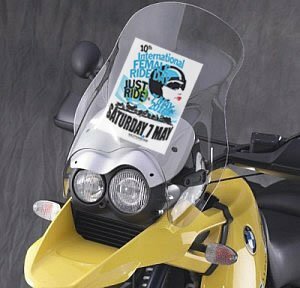 Your 2016 International Female Ride Day© motorcycle windscreen flyer. 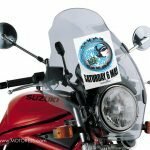 This is one simple, small way to decorate your motorbike as you ‘JUST RIDE’ on the tenth edition of the world’s only and largest synchronized women’s ride day. It’s a simple way to point out your involvement and support. Just click on the link and print the PDF formatted file. 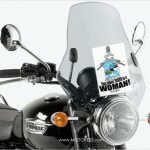 Trim, fit and “Just Ride!” This letter size document will bring your windscreen alive with the globally recognized 2016 International Female Ride Day icon image. And of course a little statement too. Over the years we’ve seen the iconic flyer placed on top cases, rear back rest bars, front wheel guards/fenders, tanks, side-panels and of course windscreen. 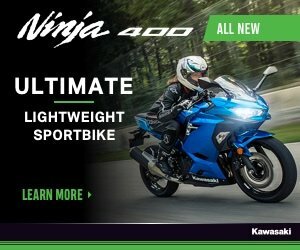 We’ve even seen the flyer placed on a rider’s backpack – awesome! It’s your time to flag and get creative. But of course, be sure where ever you place you’re safe. Watch out for moisture/ rain. If you can take the flyer to a printer and have it laminated. Another option is place in a large plastic kitchen food storage bag (Ziploc) and then attach. to the inside of your windscreen, and voila! 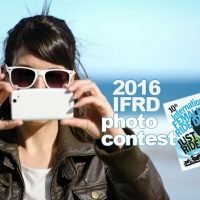 Prepare a few days in advance, not only can you pre-promote IFRD but you’ll be sure you’ve got your flyer on tight in plenty of time. Note! We don’t suggest you use this flyer if it interferes with your vision and/or path of sight on the road ahead. this may be the case on some makes of motorcycles and their style of windscreen. Do not place this anywhere on your bike where it will interfere with any safe operation of your motorcycle. Safety first! Gaskettes’ will be riding today in LA! Here’s a gallery of my favorite portraits of lady riders <3 cheers!